So, do you think this would be something for National Breastfeeding Week next year? A giant pink breast has just rolled into Pittsburgh, and it’s there to stay for the next two and a half months. The three foot tall breast sits atop Jill Miller’s Milk Truck, a mobile breastfeeding unit that is dispatched when mothers are hassled for nursing their babies in public. 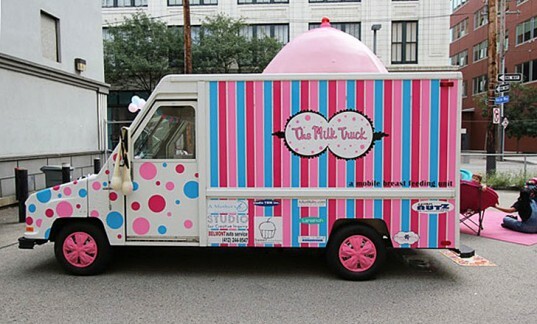 Miller, an alum of Carnegie Mellon University in Pittsburgh, created the pink and blue striped truck to spark public discussion about a woman’s right to breastfeed in public. Hit the jump to learn how to find the Milk Truck!